Preston Yancey knew what he believed. He had grown up going to church. His parents were gracious and supportive, showing him what it meant to have faith even in the midst of his mother's debilitating pain. By the time he went to college at Baylor University, he had already been on a missions trip and was sure that God was going to do awesome things with his life. But then he heard God speak to him - "It's going to be about trust with you." And then God was silent. Preston Yancey is what is lovingly called a PK (pastor's kid). I also happen to be one. For many of us who grow up in the church, it is very jarring to be out on your own and discover that things you took for granted don't hold up anymore. Then the slow work of rebuilding begins. We pick a new version of the Bible or turn to the prayers of the saints for comfort. We visit a different kind of church until we find one where we feel accepted or read spiritual memoirs to remind us we are not alone in this wilderness. This book moves back and forth in time. It begins at the moment that God went silent, and takes us through college classes, tearful church services, and whispered confessions to friends. 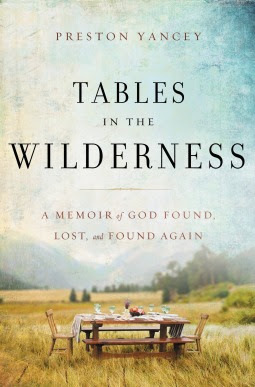 Tables in the Wilderness is about learning to be comfortable in the silence, in not knowing all the answers about faith or God or what you are supposed to be doing with your life. We all think we know everything when we are 18 and heading off to college. Yancey recognizes his own hubris and handles it with grace. The thing that really sets this apart from other stories of 20-something crisis is the beautiful writing. Yancey writes like a poet who just happened to be writing prose and brings clarity and beauty to phrases that would have been happenstance for a different author. Books and stories are incredibly important to this author, and they are present on every page. In fact, he writes about his father's statement that telling a story in and of itself is an act of worship. If that is the case, I'm glad Preston Yancey chose to worship by telling us his story and reminding us that we will not be in the wilderness of uncertainty forever. This sounds good. I like reading well-written memoirs and getting a chance to see life from someone else's lives. I just started reading that Jennifer Teege memoir: My Grandfather Would Have Shot Me. I'm really liking it. :) Great review, as always. I've heard good things about the book you are reading. I will be on the lookout for your thoughts!